Last week, I published a post about the lack of women in golf. A number of my on & offline golfing friends chipped in and helped provide some great opinions and advice on that subject. This week I want to talk about the lack of women in golf forums. Why are there so few and what needs to be done to change that? Notice a pattern? There are significantly more men on golf forums than women – about 3 times as many. What can be done to equalize things a bit? Once again, I’m calling on my forum friends to tell me what they think – why do so few women join in on the dialogue and what needs to be done to increase their numbers? I can see that. Safety in numbers and all that. Hmmm…so women don’t feel welcome. I wonder if the forum owners know that or even care? So what does the forum funny girl, Christy, think? Now, I should be including what Kevin had to say about this subject, but after talking with him about it on the phone for about 1/2 hour, I realized his experience deserved its own article. Check it out in Inside Golf Magazine: Golf Forums – The Naked Truth. But Kevin did say, based on his wife’s comments, that if the forums offered more topics that interested women, like golf fashion, then maybe more women would participate. So, it would seem that women golfers don’t join forums for the same reason that women don’t take up golf in the first place. Women don’t feel welcome in those male dominated worlds. 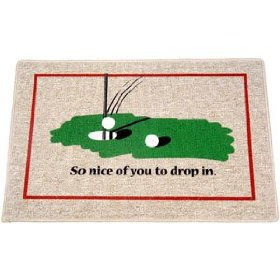 That may be true, but I think getting more women to participate in golf forums goes beyond putting out a Welcome Mat. I’ve been participating in half a dozen golf forums for just over a year now and it’s pretty evident to me that the women who do join in on the discussions are a unique breed. They tend to be quite confident and can dish it out as well as take it. They usually have a pretty decent golf game and are not afraid to mix it up with the boys. These ladies are thick skinned; they are NOT your average women golfers. 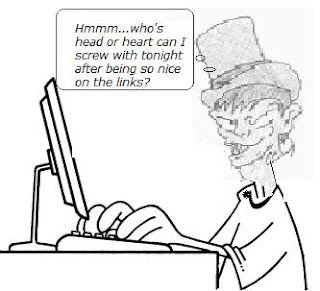 Most women I know would be quite amazed at the “discussions” that take place on golf forums. Forum members can be brutal at times. During the Big Break series, the contestants were recommended NOT to read the forums for good reason. I was the first one to second that recommendation. I still can’t believe what forum members said about the ladies on BB Ka’anapali. It was sad actually. Yes, I certainly have seen some nasty stuff out there. I remember a young woman posting a question on a forum about why some guys don’t like playing with women who are better than they are. The responses got really ugly and I ended up sending her a personal note pleading”Say no more and walk away from this thread. You’re digging yourself into a grave.” Unfortunately, she didn’t take my advice and the results were not pretty. I’ve seen her recently on other forums. Yes, I’ve seen that kind of behavior. People hiding behind their avatars and nicknames. But to be fair, I’ve seen the other side too – nice people like Aimee, Apryl, Christy and Kevin, who make the forum experience entertaining and informative. I just wish all the members could be like them. If they were, I bet we’d see more women online. This week I will be interviewing Josh, owner of TheHackersParadise. THP is a fairly new forum that is co-owned by a woman. Come back later this week to find out what THP is doing differently to attract more women to its membership. As a male blog owner, it’s a difficult one this. I don’t want my blog to be a man only environment and always welcome interaction with box sexes. In fact I always try to put something in there for the girls. That said, it’s difficult as I don’t really know what girls want from a golf blog and I don’t want to mess up and offend people. Fashion seems an easy choice but obviously the girls don’t just want fashion golf, they want to feel welcome on a site that makes an effort to include them 100 per cent. What a great article – I think I’ll do a blog post on what women want from a golf site and find out…trackback of course.. Thanks for your comment. I visited your site and you have a ton of content there. I love to talk golf with whomever is on site, but rarely do we chat about fashion. Communication usually ranges from the type of golf clubs we use to playing conditions of the courses. Thanks for your advice, that’s ace. I’ll definitely start covering more stuff for the ladies. We’d love to add a woman writer to our team or at least have a few guest writers? At the risk of sounding cheeky – would you be interested? Perhaps we could exchange a few articles? I’m honored you would ask, Jon. Let’s chat offline – I added my email to my profile, so why not send me a note and we can discuss. haha..thanks for your comments. I’m like you in that I rarely discuss fashion in the forums (unless it’s bad and I can make fun of it LOL!). But fashion does get a lot of other women’s attention it seems. So it’s “to each her own” I guess. Diversity of topics is important for sure. Women have so many interests. Great post (sorry I’m late to the party) and lots to think about. When Dave and I started Golf is Hard TV we made a conscious decision to be both kid and female friendly – we’re still putting things into place but are absolutely positive that there is a huge opportunity to engage women online in a way that doesn’t include mysoginy or the typical guy attitude. As the father of 2 girls who both play golf a little it’s important to me that our show appeal to a broader audience than just the old boys club. We’re in talks right now with several female golfers and are even looking to work closely with the local high school teams – those girls are terrific golfers! Golf Gal – would love to chat with you anytime and even invite you to be a guest on Golf is Hard TV – http://www.golfishardtv.com anytime! Hi Marc! Would love to chat with you. Let’s connect offline. Pop me an email and we’ll set up a time. Facebook and Twitter are a lot friendlier places to hang out and chat about “all things golf”. So happy I met you there! Gayle, this is an awesome article. I think the first assumption people make is that to get female golfers you need to throw some ‘stereo-typical’ female content their way like fashion, or exclusively LPGA content. Most of the women golfers I know can talk intelligently about ALL aspects of the golf world, usually moreso that I can:) It’s really just about making em feel just as welcome as the guys. I’m actually working on a project cadee.co where we’re trying to build a community of golfers that’s open to EVERYONE, of all skill levels, background an gender. Would love to have a chat offline and get your thoughts on it, we’re just starting to build some of the community aspects into it. Thanks Stephen for your comment. I’ll definitely check out cadee.co and get back to you offline on that. I tend to agree with Hailey. It is very difficult to find women golfers that are really serious about the game. And I think you have to be pretty serious about golf to spend time in golf forums. I wish it would change. I run http://agedefyinggolf.com 60% of the golfers that come to our physical facility are women but but less than 25% of our web visits are from women. I’m not sure this will change despite the fact that our program actually benefits women more!